The Arlington County Board today approved a blueprint for a dynamic park in the heart of Rosslyn. 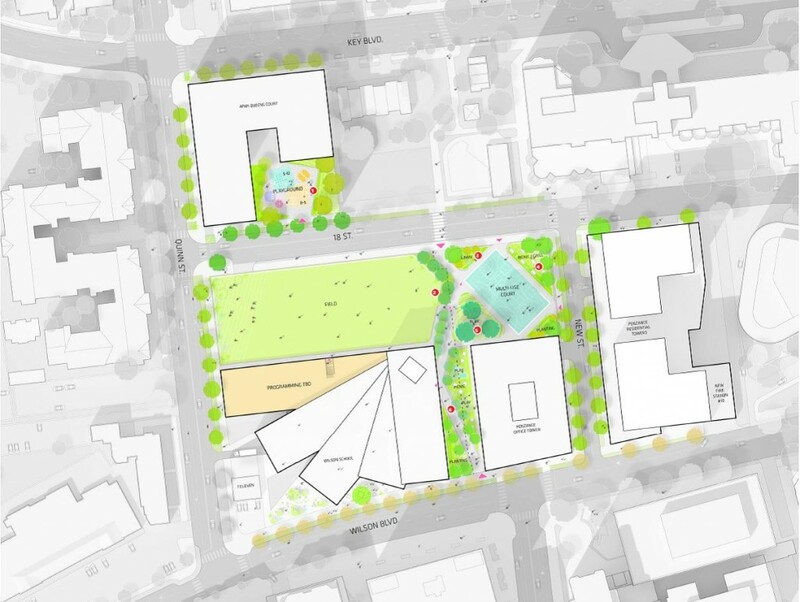 A robust community process led to the development of the Rosslyn Highlands Park+ Coordinated Open Space Plan, the conceptual plan for a park that will be part of an even bigger project that will include a new schools, affordable housing, an office building and a new Fire Station 10. The Board voted 5 to 0 to approve the plan. Read the staff report on this Item, which contains details on the planning process, community engagement and design elements for the park and associated green space. Scroll down to Item No. 55A on the agenda for the Saturday Sept. 24 Regular County Board Meeting. The planning process for the park and other associated green spaces that are part of the Western Rosslyn Area Plan (WRAP) began in the fall of 2015, with County staff working with the community to develop a conceptual plan that would integrate three pieces of open space — spread over three sites within WRAP — into the redeveloped Rosslyn Highlands Park and associated, integrated open space. The community and County planners met the challenge posed by integrating the three fragmented open spaces as by proposing a dynamic, urban community space that offers a balanced array of active and passive recreational amenities. The park will be built in three phases, in partnership with the three property stakeholders: Penzance Companies, Arlington Partnership for Affordable Housing (APAH) and Arlington Public Schools (APS). The project plan underwent three major phases prior to County Board review. Data collected, assessed—existing and future site conditions, including topography, sun-shade, and circulation, as well as demographics, park experiences and transportation conditions of the greater Rosslyn vicinity were analyzed. Community visioning and concept development–broad outreach to engage a wide section of North Rosslyn residents, businesses and workforce included mass distribution of flyers, email announcements and social media promotion culminated with a series of three community workshops, an online survey and on-site interactive feedback methods. Commission review and concept refinement–both the Park and Recreation Commission and Urban Forestry Commission expressed their support for the proposed plan. The project team shared the refined concept plan and design guidelines at a community open house on December 10, 2015. Penzance, APAH, and Schools will each redevelop their portion of the WRAP area subject to the approval of use permits and site plans whose public review will begin this fall. The park project is expected to be designed and built over the next approximately six years, in conjunction with APS building its planned school, Penzance building its planned residential buildings and APAH building its planned affordable housing building. Design of Wilson School facilities and grounds will be reviewed as part of the County’s Use Permit review process. A Memorandum of Agreement between the County and Arlington Public Schools will outline the use, design and construction parameters of any shared-use facilities and stipulate the operations and cost-share of any shared-use facilities. The recently adopted FY2017-2026 Capital Improvement Plan shows a total project cost of $9.28 million for the development of all the park spaces. The terrace and indoor amenities of the Wilson School are not included in this total project cost. Funding will come from a combination of contributions from Penzance, bonds, and other funding.